You won’t see John Calvin bobble-heads or Martin Luther window clings in the seasonal aisle of your local discount store, but Reformation Day is right around the corner. Many Reformed churches sponsor conferences this time of year, which recharge adults’ Reformed batteries, but what about the kids? How does your family or church jumpstart children’s love for the Reformed faith? Readers who’ve known me for many years may recognize this as a subject close to my heart and remember the original Reformation Celebrations at our local Christian school. From the beginning planning stages of those events, organizers believed that while learning about our great Reformed heritage was crucial, no event for kids could succeed as an alternative to Trick-or-Treat unless it included two elements: fun and free candy. Rev. Andrew Eenigenburg and the people at West Sayville Reformed Bible Church share a desire to teach children about the Reformation in an interesting way while making a small concession to their sweet tooths. I’m writing an article about their annual special Sunday school celebration for families that includes candy for kids, but focuses on presenting and reading a Reformation-related book. 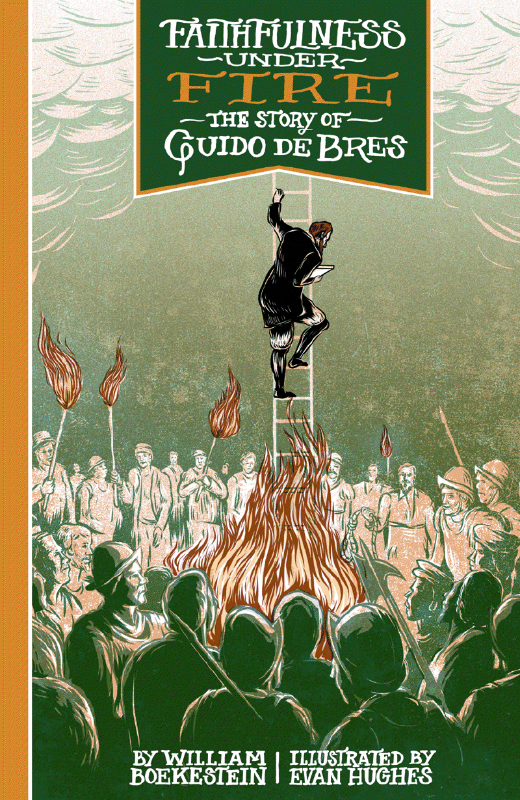 Last year’s featured book was Faithfulness Under Fire: The Story of Guido de Bres by Bill Boekestein. I reviewed the book and interviewed Boekestein and artist Evan Hughes last year. You can read both the interview and the review here. Guido de Bres was the author of the Belgic Confession, one of the three confessions embraced by Reformed churches in the continental tradition known as the Three Forms of Unity. Boekestein has since written a book describing the history behind another of the Three Forms of Unity: the Heidelberg Catechism. He plans to write a third book on the Canons of Dort. This year West Sayville Reformed Bible Church will incorporate Boekestein’s second book in its Reformation-themed family Sunday school. And I hope to review the book in Christian Renewal as well as on this blog. You can view a trailer for his new book here. Boekestein’s book on the Heidelberg introduces children to the three men most responsible for crafting the popular and well-loved catechism: Caspar Olevianus, Zacharias Ursinus, and Frederick III. 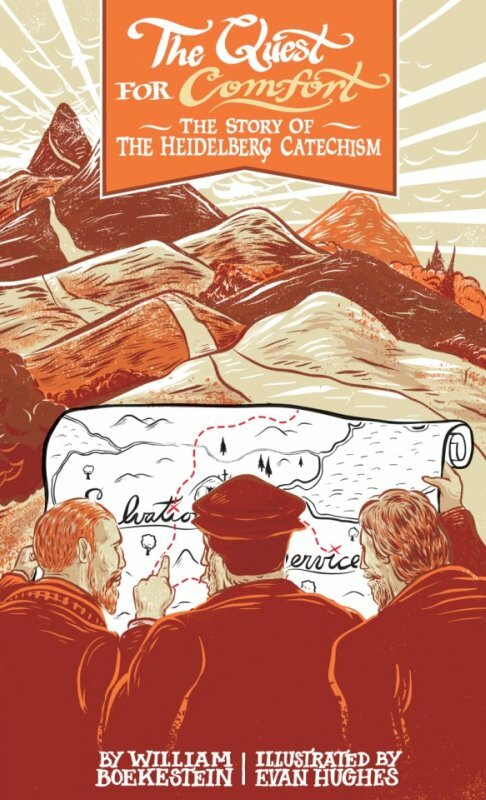 Evan Hughes again contributes artwork to the combined effort: The Quest for Comfort: The Story of the Heidelberg Catechism. Each book is available from Reformation Heritage Books for a mere $7.50, about what you’d pay for a couple cups of flavored coffee. The coffee might jumpstart your mind one morning, but the books will ignite young minds for a lifetime. These two little books are excellent resources for parents or church educators who want to introduce children to the authors of Reformed confessions and the critical times in which the works were written. Church school instructors using Not My Own: Discovering God’s Comfort in the Heidelberg Catechism may want to consider using Boekestein’s The Quest for Comfort as a supplemental reading during class or giving it to students as a Reformation Day or Christmas gift. Not My Own by Glenda Mathes (yes, me) is the first volume in the “Life in Christ” catechism curriculum produced by First United Reformed Church in Chino, CA, and available from Reformed Fellowship. Other Reformation-related resources for children deserve mention in this post as we anticipate observing Reformation Day next Monday. Janie Cheaney and Emily Whitten, the wise women over at Redeemed Reader, are currently giving away a copy of Reformation Heroes, a book by Diana Kleyn and Joel Beeke. This is an excellent book that has been placed in our church library. Since it sells for $25 on Amazon, you may want to check out their contest! The October 26 post at Redeemed Reader features a guest review by Shanna Gonzalez of Paul Maier’s Martin Luther: A Man Who Changed the World. The review is worth reading simply for its handy pronunciation guide at the end. Although I’m short on time and this listing is far from exhaustive, I can’t conclude this post without mentioning the beautiful and excellent books by Simonetta Carr. 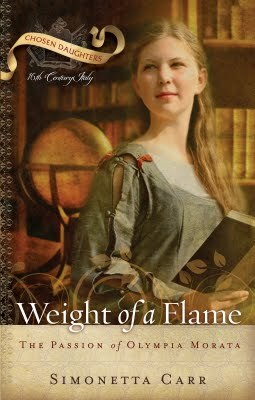 Simonetta has written books on John Calvin, Augustine of Hippo, Athanasius, John Owen, and will soon release Weight of a Flame: The Passion of Olympia Morata. Her books are available from Amazon, Christianbook.com, Reformation Heritage Books and other distributors. Each book is a literary and visual delight! John Calvin bobble-heads and Martin Luther window clings may remain scarce. But Reformed parents and educators have access to some very helpful books that can help them spark within children’s hearts a lifelong love for the Reformed faith.